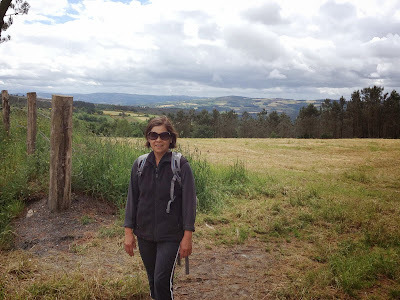 When asked what my motivation was for doing the Camino, I jokingly answered, “to check off my list of things to do before I die.” But deep inside, I had a very personal reason for walking the Camino. Four months after recovering from cancer, I joined the San Francisco Bay to Breaker marathon and surprisingly surpassed my goal. So I decided to take on a more challenging physical activity. 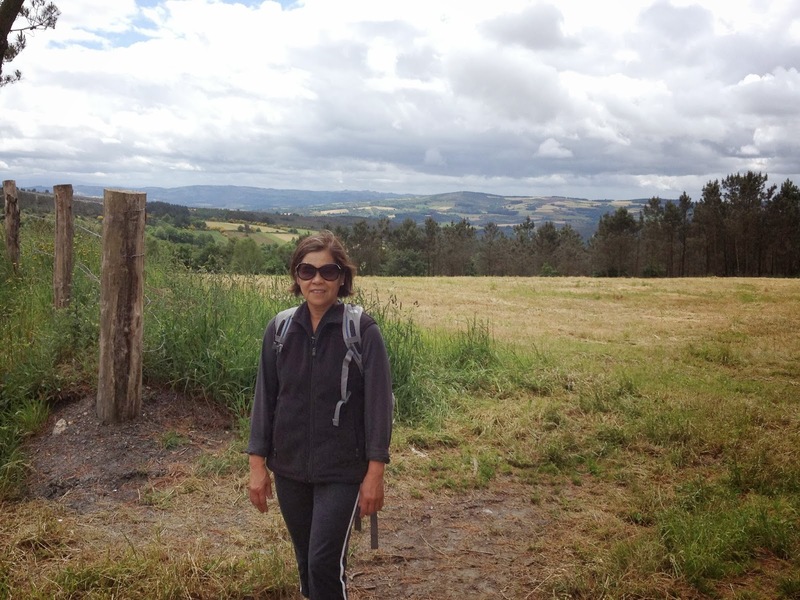 Walking the Camino seemed to be a natural choice since it combined both spiritual and physical activities. Also, I had always wanted to go to Northern Spain to experience the culture and cuisine that's instinctively Northern Spain. I thought it would be overly ambitious for me to walk 800 kilometers from the French/Spanish Pyrenees border all the way to Santiago de Compostela, or carry a heavy load on my back, so I signed up for the +100k walking tour. I met my fellow walking travelers in Madrid. My fellow travelers, ages ranging from 19-70 came from different parts of the world – Australia, Costa Rica, Ireland and the United States (Tennessee, Texas, Florida and California). The tour managing director, Ligia, introduced us to our driver, Carlos, and guide, Ignacio. Before we set off for Leon, she gave a few words about our expectations and potential concerns and gave each participant a card/letter of encouragement which we were supposed to open later. We traveled by bus from Madrid to Astorga, Leon where we visited Gaudi’s museum for pilgrims and the massive Catedral de Santa María – an edifice built in the 14th century and completed in the 18th century. The cathedral is a combination of gothic, baroque and renaissance architecture. Then we continued on to a tiny medieval village of Castrillo de los Polvazares. We walked the cobblestone street, lined by stone houses, to get to the gastronomic center of the area. On our first meal together, we were introduced to Leon’s famous cuisine “El Cocido de Maragato”. This dish consisted of a slab of animal fat, ham, pig’s feet, pig’s ears, ribs, chicken, meat and more meat with garbanzos and cabbage on the side. During lunch we found out that the 13 of us had one thing in common – we all love good wine. So it was here that a new family was formed. After lunch, our guide, Ignacio, reiterated what the tour director had said about our expectations and possible concerns. He handed each of us a package containing daily route program, books, maps, insurance card, and pilgrim souvenirs and the ‘Credential’ (The Credential is a kind of passport that accredits us a pilgrim, and testifies to the places we visited. It had to be stamped at least twice daily. Stamp or selyo could be obtained from café bars, churches, municipalities, and other institutions). He explained that on the Camino we are never alone. We could choose to walk with someone or walk alone. But we could never lose our way to Santiago as the ‘way’ is full of markers (yellow arrows, shell and pumpkins, and kilometer markers). The main message was to enjoy the Camino. Taking his word, I did not bother to read the materials in the package. The journey from Leon to Sarria was rich in history and stunning landscape. We stopped by the village of O Cebreiro known for its pre-historic houses and the church of Santa Maria la Real. We reached Sarria where we found our first accommodation (Torre Do Barrio) well tucked-away in rural farmland. This rural manor is rich in history – a prelude to other places of accommodations to come. Our accommodations comprised of rural homes or manor once owned by nobles and important people and a monastery. After breakfast, we set off to walk the next 108 kilometers. Our schedule allowed us to divide the course into 6 stages (with an average of 22km the 1st five days, 5km the last day). The level of difficulty varies from day to day. The walking route varies from the stony pathway, wooded pathway, paved roads, cobbled streets, and trail covered with a canopy of trees. On our first walking day, our path was lined with purple foxgloves and wildflowers and occasional rural homes with vegetable gardens. The trail was also littered with cow & horse dungs. Instead of enjoying the pastoral and scenic view, my over-sensitive nose took over. I also discovered a new food allergy from eating energy bar with peanuts. This mishap slowed me down. When I reached the paved road, I encountered a herd of cows and sheep. Following a herd of sheep puts walking the Camino in perspective. Needless to say, I was left behind. Then I remember what Ignacio told us, “it’s not a race…if you can no longer walk, you hop on the support vehicle.” As I passed the herd of sheep, I saw a minibus approaching and recognized Carlos, our driver, and Ignacio. Thinking that the rest of the group had completed this stage of the walk, I thought they came to fetch me. I waved my arms to Ignacio who then gave me a signal to continue on and announced that I still have 3km to go. My feet were fine until I tried to step up my speed the last 3k. By the time I got to the designated meeting point, my allergies worsened. In retrospect, I was glad my weakness manifested early on. I found how caring and supportive my new found family, especially Carlos our driver. The language barrier disappeared in the process of caring. Carlos did not stop until we found a pharmacy to get my allergy medicine. My fellow travelers who spoke Spanish translated the medical warnings on the label, stressing the part that the medication should not prevent me from having a glass of wine. Carlos became particularly sensitive to my needs, handing me bottled water and energy bars free of nuts. The following day, the weather forecast was bleak. It was supposed to rain all day. Having walked the trail the day before, I expected the worst. Thank God for the waterproof hiking shoes and Ignacio for loaning me a heavy raincoat, I was ready to face the worst. The weather turned out to be perfect for walking. The sky was covered with clouds, and it sprinkled for only a couple of minutes. Along the way, we exchanged ‘Buen Camino’ (translated to ‘have a nice walk’) with other pilgrims – a lot of young women on foot and young men on a bicycle. At the café bars, we get to compare notes and found some pilgrims who started in France and had been walking for weeks and staying in ‘albergues or refugios’ (hostels for pilgrims). Seeing both young girls and older people with heavy packs on their back made me feel guilty. Not having to carry a heavy load on my back or worrying about the next accommodation made me realized that our group traveled as privileged pilgrims. We had meeting points where Carlos and Ignacio awaited with snacks, fresh fruits, and bottled water. Our luggage or personal belongings were hauled from one hotel to the next. We were assured of accommodations with WIFI and sumptuous meals with wine. One hotel even had a Jacuzzi where I was able to soak my tired feet. On the 2nd stage, I walked with the younger pilgrim Nela. She could carry on a conversation and could walk really fast at the same time. We had a pleasant conversation that I did not realize the distance we had walked. We were one of the first to arrive at our designated meeting point (Palas de Rei). The following day, I walked with the mother and daughter team from Ireland. I admire their great relationship, the mother for her stamina and strength, and the 19-year old daughter for acting so mature for her age. We had a pleasant conversation while traversing through a pastoral landscape. After the walk, we came together for lunch at a designated meeting point. Lunch normally lasted for hours, followed by a few bottles of wine, mugs of beer and pitchers of sangria before heading off to the hotel. Then our group usually got together for a round of drinks (wine) before dinner, gaining our group the nickname “WINE CAMINO”. Then we attended the pilgrim mass at noon. After the mass, a singer sang a ballad… “I remember how he embraced me, how he lifted my heavy load, without me knowing…” The song lyrics brought the events of the past week into view – the pastoral landscape, the meadows, the medieval village and the people we met along the way. Then it hit me, I broke down in tears. I have achieved my goal. Fifty meters away from the Cathedral was our accommodation (Hospedería San Martín Pinario). After checking into our hotel, I called home for which I received the fantastic news about my sister medical test result. I was overcome with emotion and decided to rest. Later that night, the whole group met up with Ignacio for a surprise dinner. We walked another block along the narrow cobbled street to Hotel de Los Reyes Católicos. We were greeted by a hotel employee who toured us around. This Parador was originally built in the 15th century by the Spanish monarchs, Ferdinand and Isabel, as an enormous hospital to shelter and care for thousands of poor and sick pilgrims. Today it’s one of the finest paradores (luxury hotel run by the government) in Spain. We had one of the finest dinners on this trip. We were entertained by a witch who made a concoction of home-made orujo. We drank the concoction and made our goodbye speeches. The following day we toured Santiago de Compostela and the cathedral in depth. Later that day, I had the chance to attend a special mass officiated by an archbishop and saw the botafumeiro, the largest censer in the world. What an added treat to a wonderful finish!